Just a quick foodie post lately about 2 recipes I've made lately that I wanted to share! Oftentimes I like to take recipes or flavours I've eaten recently as inspiration in the kitchen, instead of as literal things to recreate. Playing with ingredients and testing my ability to mix flavours is what makes a potentially boring chore a fun occasion every time! This dish below is what I'm christening a "hot pot" dry noodle dish. 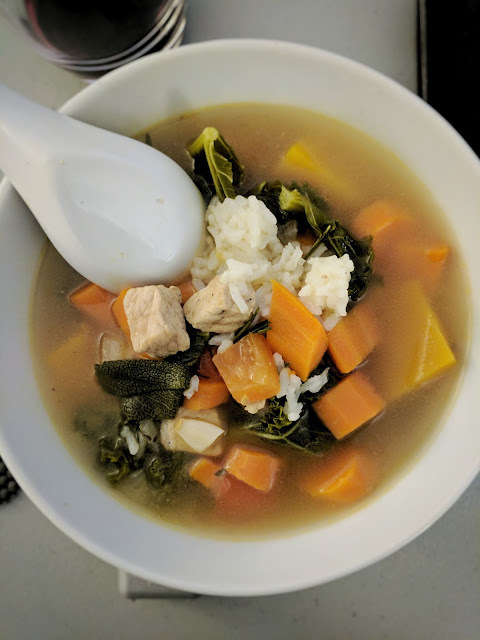 I had a bunch of leftover ingredients from NYE where we had friends over to make Chinese hot pot. I was really craving the savory, meaty and spicy flavours of the hot pot sauces, but I didn't feel like making a whole hot pot, so I opted to try mixing everything into a dry noodle dish and the result was awesome! First, I cooked the udon in boiling water until soft and chewy. Then in a wok, I sauted the ground pork with a bit of salt, white pepper and chopped garlic. Once the pork was cooked, I threw in the enoki mushrooms, tearing the bundle into smallish chunks, and the noodles, and tossed them all together until the mushrooms were nice and soft. In a small bowl, I then combined some generous tablespoons of sa cha sauce with a bit of soy sauce and stirred to combine until the resulting paste turned to a slightly runny sauce. 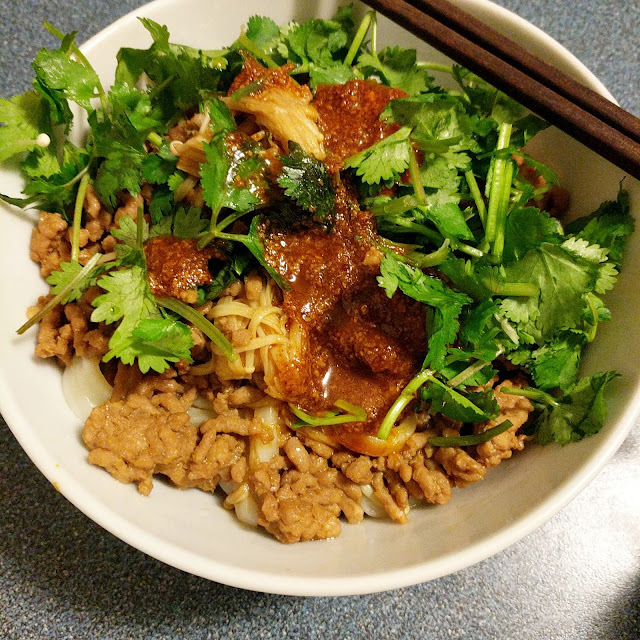 To serve, I simply poured the contents of the wok into a bowl, liberally sprinkled it all with chopped fresh cilantro and a hearty heap of sauce! My goodness, this dish is craving personified. It's an explosion of umami and salty goodness combined with the sharp tang of cilantro and the soft chew of udon. Definitely making this hearty, yet simple dish again! This next dish is definitely on the healthier side of the food spectrum, but just as delicious as the previous one! This healthy veggie based soup is based off this Kale and Roasted Vegetable Soup recipe off Yummly. I'd never tried cooking butternut squash before, but I'm hooked! This mild tasting squash tastes so good in soups and is chock full of nutrients. The original recipe calls for lentils and is vegetarian, but I forgot to buy lentils so I threw in some leftover rice at the last minute instead. I also fried some pork loin in a saucepan separately as well and threw it in as well for some needed protein. I love these kinds of soups in the winter as they're nutritious, full of warm, soothing flavours and so easy to prepare. Plus you'll get lots of leftovers! What have you been cooking lately? I'd love to hear your dish recommendations!